The moment I saw it, I knew it was the one! I had no idea what to expect with the dress shopping experience. Having never stepped in a bridal shop, I was instantly intimidated. Armed with one of my bridesmaids, I took the plunge on a Saturday afternoon (future brides – expect to meet every other bride if shopping on a Saturday afternoon!). We started our adventure at a not-to-be-named small shop in the east end. I had booked an appointment (who knew this was required!?!) but was still vastly uncertain on what I was looking for. 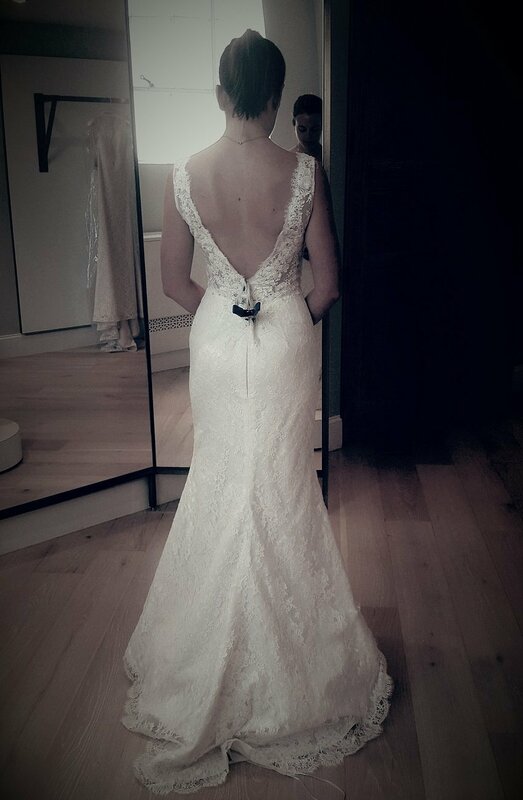 All I knew is what I didn’t want – a typical strapless dress so common in the bridal industry. Turns out that’s a good place to start. I instantly soured on the experience because our obnoxiously cheery consultant wasn’t hearing me. I wanted a stunning feature! Something different. A wow factor. I tried on a few different styles, none resembling my request, and was greeted with her over-the-top positivity that struck me as disingenuous. I understand it was well intended but I needed a more intimate, less vocal approach. After five different dresses in all different styles, we quickly jetted for lunch. Encouraged by Jessica Mulroney, Kleinfeld’s bridal expert, I booked an appointment at Kleinfeld’s for the following morning. I dragged myself to the 7th floor with a coffee in hand and a healthy dose of skepticism in my step. Having only heard of Kleinfeld’s on the American “Say Yes to the Dress”, I was anxious I was playing above my bridal weight. Deciding to go alone, I met my consultant Stephanie. I gave her my vision and importantly, my budget. We walked the floor, looked at dresses and she asked me what I liked and didn’t like about certain styles. Before we even got to trying any of the dresses we had gathered, she looked at me and boldly stated, “I think I have the perfect dress for you”. Out came the MikaellaStyle 2016 and it was love at first sight. As Stephanie helped me into the dress, I knew my shopping journey was coming to an end. It was perfect. Everything I wanted. A plunging neckline for my ‘wow’ factor. The perfect shape to complement my athletic body. A dress that made me instantly feel beautiful. A dress I know will make Tyler’s jaw drop. My perfect dress. The perfect shopping experience. Be sure to check our blog again next month as we’ll be featuring more of Deidra’s journey!